Ministers must not take “cheap options” when it comes to equipping the Armed Forces to fight the wars in Iraq and Afghanistan, the head of the British Army warns today. In an exclusive interview with The Daily Telegraph, General Sir Richard Dannatt says the Government has an “absolute responsibility” to provide the best training and equipment for the British men and women serving on the front line. “If you are committing young people to battle they have to be given the best, and when circumstances change they have to be given the best again,” he said. His comments came as the Ministry of Defence announced the death of two Royal Marines in southern Afghanistan, taking the British death toll in Iraq and Afghanistan to 300. 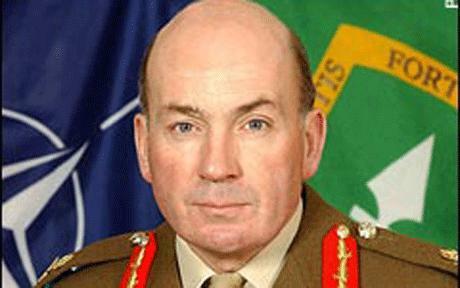 Gen Dannatt, who will retire from the Army next year, has been outspoken on defence issues since taking up his post in 2006. In 2006, he warned that the Army could ‘break’ if British soldiers were kept too long in Iraq. With Britain now preparing to withdraw its 4,000 troops from Iraq next year, pressure is mounting – from sources including Barack Obama, the US president-elect — for more British forces to be sent to Afghanistan. But Gen Dannatt said that no more British troops should go to Afghanistan, insisting that the Army only has the manpower and resources to fight one foreign war at a time. He said that many improvements had been made in equipping front line troops during the past two years, but serious consideration needed to be given as to whether it was sufficient that only 5 per cent of the government’s budget was devoted to defence spending. British Royal Navy commandos gave chase to suspected pirates off the coast of Yemen, killing two of them in an ensuing gunfight. The HMS Cumberland was on a routine patrol in the Gulf of Aden on Nov. 11 when it spotted a Yemeni registered fishing boat, or dhow, positively identified in a hijacking attempt on a Danish cargo ship, the MV Powerful, earlier in the day, the U.K.’s Ministry of Defense said in a statement late yesterday. After “non forcible methods” to stop the dhow failed, the Royal Navy launched small assault craft to encircle the vessel, the MoD said. The pirates opened fire and the Navy fired back in self defense, according to the statement. Two foreign nationals, believed to be Somali, were shot and killed, the MoD said. A Yemeni was found injured and died later. He received emergency treatment from Cumberland’s doctor, the MoD said, though it wasn’t clear whether his injuries were due to the firefight or to a previous incident, it added. Moscow is moving to reduce what it calls “bloat” in its military forces, especially among the Generals and Admirals of the hierarchy. You are currently browsing the archives for the Ministry of Defense category.